From the Private skincare collection Christine Dion uses for herself. 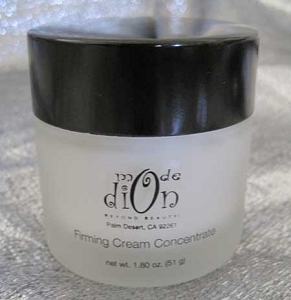 Firming Creme Concentrate with 3D Remodeling Complex is a topical alternative to invasive anti-wrinkle injections, helps firm, tone and redefine facial contours for a noticeably lifted, more sculpted appearance. Velvety, almost balm-like creme targets deep wrinkles, filling-in their length and depth so facial features appear more sculpted and defined. Super hydrating humectants plump-up fine lines and wrinkles for a fuller, more youthful look. Does not feel greasy yet super hydrating. Based on a 90 day clinical study of 50 women ages 43-56 years old.